Columbus Pizza & Donair is proud to serve the quality homemade donairs Edmonton loves. Whether you’re already a donair lover or have never tried one before, we’re sure you’ll appreciate the flavours of our fresh, delicious ingredients. A donair is made by cooking a large cone-shaped portion of meatloaf-like ground beef on a tall spit. The meat is roasted slowly and continuously. As the out edges cook, they are shaved off, fried, and placed on top of a pita. Next the meat is covered with a signature sweet sauce that is comprised of evaporated milk, sugar, vinegar, and garlic. To complete the dish, our donairs also come with cheese, onions, and tomatoes. Once you come try our mouth-watering donairs, you’ll see why Edmonton customers rave about the incredible flavour and keep coming back for more. The donair was created in Halifax, Nova Scotia in the late 1960s by two Greek brothers John and Peter Gamoulakos. These brothers loved the traditional gyro from their home country, and they tried to sell the dish in their restaurant. However, the traditional gyro wasn’t quite right for the tastes of their Canadian customers, who were not used to the Greek flavours. 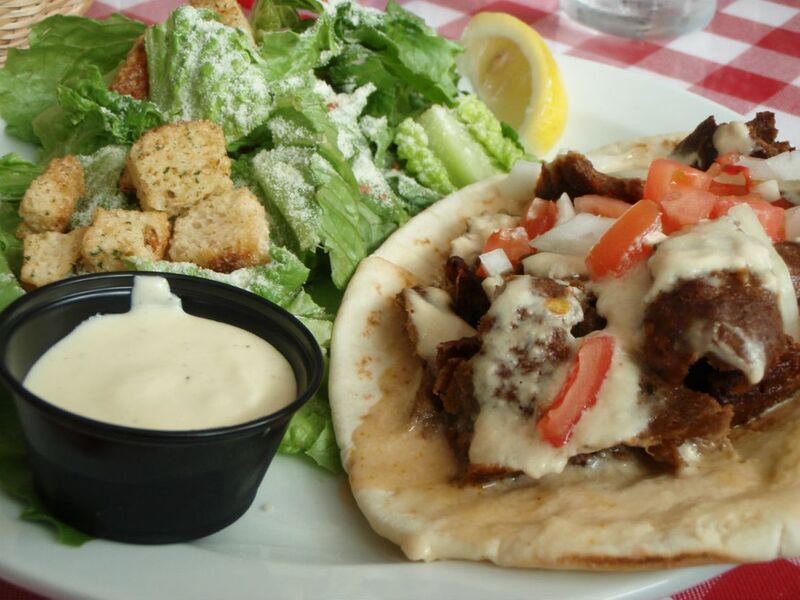 The brothers wanted to take the gyros they loved and remake them to suit Bluenose taste buds. So, with a few tweaks, the traditional Greek gyro became the Nova Scotian donair. The brothers substituted ground beef for the traditional lamb and added a sweet sauce of their own design. The name “donair” was coined by Peter when someone asked him what his creation was called. He happened to look at the meat rotisserie machine which had the word “doner” written on it, and so that’s what he called his dish. Eventually, the name came to be known as “donair”. The donair’s place in history was confirmed in 2015, when the Halifax city council voted to make the donair the official food of the city. Today, donairs are available across Canada, so come try one today at Columbus Pizza & Donair! Want a donair in Edmonton? Come give us a visit and try this much-loved Canadian contribution to the world of cuisine today.